I don’t know about you but I get very overwhelmed when it comes to food storage and year supply. There are so many great websites to help start your food storage. I just wanted someone to tell me what I needed to get and how to get everything on a budget. 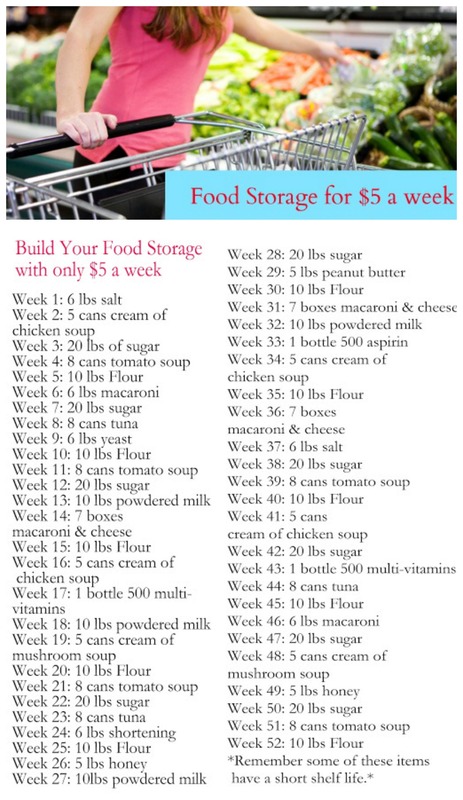 I was emailed a list of how to build your food storage on a $5 a week budget and I was beyond excited! Depending on where you shop, it may be slightly higher but you can definitely do this on a tight budget. I wanted to share this list with you guys. I did make a few minor changes, he sure to make changed for your own family. For example, if your family does not like tuna then buy canned chicken instead. 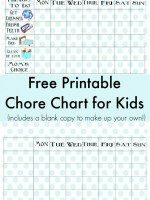 Here’s a printable list so you can print it off and keep it somewhere handy! Stash $5 here and there in your year supply, so you have a little cash. Also, if you have baby or toddler, you may want to include items for them such as diapers, wipes, formula and/or baby food. I know that there are many other things that can be added to this list, this is just what I came up with. I would love to hear what you guys have come up with…I am ALWAYS looking for more ideas! Leave any suggestions in the comments as I’m sure we could all use each other’s expertise! I love how you can build this up gradually, without too much money being laid out at one time. It’s not really an option for me. I can barely store enough for a few weeks in my Brooklyn apartment. This list is only for people with lots of storage room. You don’t need lots of storage. It’s all about being creative with space. Use the bulky items as tables (cover with a decorative cloth to hide what it really is), etc…. Some people use space under the bed, in the linen closet, etc. Be creative! When I used to live in a tiny apartment, I made storage space by things like getting a bucket, buying a circle of plywood to use as a table top and a floor length tablecloth. Fill the bucket with food storage items, put the circle of wood on top, cover with tablecloth, add lamp, whatever and you have some food storage (and an end table). I also stored food under my couch, bed, anywhere I had space. I was amazed at what I could fit in a tiny space. I just had to think out of the box. Good luck. The honey is something you DEFINITELY want to get though. Honey is the only food on the planet that NEVER SPOILS. You can actually use it on open wounds to promote healing too. Oh I needed this! Getting my food storage together has been such a daunting task for me. Now I just have to figure out where to put it! This is such a great idea! I like that it’s not too crazy (like “buy 100 boxes of cereal all at once3”). Great tips! I like this plan. It seems that I’m always running out of those staples when I need them. Thanks! This is a fab idea but why so much sugar? You can use it for bartering. I’ve been wanting to do this!! 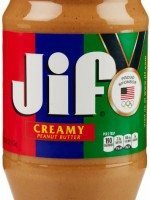 Unfortunately it’s tough when you’re trying not to eat canned food because of the BPA, and trying to get whole wheat or non-wheat pasta/bread/grains, butter instead of shortening, organic milk, whole wheat mac n cheese, and peanut butter that’s just the peanuts and salt. It’s been a challenge!! I’m with you. This is like a guide for how to stock up on all the things nutrition experts have been trying to get people to LIMIT in their diet. Flour and sugar are big no-nos. Canned tuna is LOADED with mercury. Personally, I see no need for such gross hoarding when so much is thrown away every day – almost 3% of Australia’s greenhouse gas emissions come from food rotting in landfill; people WILL survive if they stop being wasteful. However, I see even less need for you to criticise the writer, when she is just trying to be helpful. If the article isn’t useful to u – move on! AMEN! Personally, this would work wonderfully for me. Even though I am trying to cut some of that stuff out of my diet, I can afford $5-7 per week, and instead of using all of the flour and sugar in my regular food rotation, I will donate it to our local soup kitchen a couple of months before the best by date and replace with fresh. I can guarantee that if I need several weeks or months of food storage I won’t be worrying about the percentage of organic whole grain low carb blah blah etc. in my caloric intake. Win for me and win for the community! Thank you to the author and thank you to Joanne! So glad it was hopefully to you!! Thank you for stopping by! Well, considering this isn’t a guide for what to eat on a daily basis, but rather a way to stockpile food for an emergency, your comment is unnecessary and quite frankly, said from up on top a pretty high horse. I don’t think Savannah is trying lead us down the road to horrible eating habits. The simple fact is that the things on this list are food items that last longer in storage. This is a guide for a cheaper way to stock up on necessities. Obviously, if you prefer whole wheat pasta, whole wheat flour, etc (like I do), you need to stock up on those items and know you might spend a bit more. So, take her list, change as you need to and trust that we aren’t all lemmings who will only buy what this list us to without our own research or thoughts on it. And, for what it’s worth, Tuna isn’t “LOADED with mercury”. It’s not that simple. Tuna does carry mercury, as do most fish, but there is a way to avoid the higher concentrations of it. 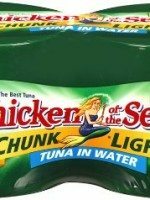 If you buy chunk light over albacore, you’re going to get less mercury. The American Pregnancy Association wouldn’t have in their guidelines that tuna is safe for pregnant women to eat up to 3 cans a week if it weren’t safe. So, having 24 cans spread over a year for a full family seems to be well within the safe guidelines. I’m sure you are well-educated on these things as well, but you would come across much more intelligent and less judgmental if you commented with fewer flawed generalizations and more actual factual statements. Considering that you have to actually rotate (EAT) your food storage, as it does not last forever, you DO actually have to take into account whether you can/will eat the food. Even if youre fine throwing it away when it expires, what about if/when disaster strikes and your family gets sick from eating unfamiliar unhealthy foods? I agree with Jess. There are ways to storing whole wheats instead of white flour. You just need to get some recipes that teach you how to use them. And make sure that you have something to grind them up if you lose power. You can do many things to help make those changes for the things you are trying to eat. But if you like bread and run out in an emergency… having things like flour can go a LONG LONG way for your family. Don’t store things that you hate to eat. But do store things that you can really use. I have had times that I’ve had to have my family live off our food storage and having these essentials might seem like alot. But when that’s all you have… you will be grateful for them! Wow! Thank you Jess so much for so eloquently pointing out simple damn truths to all those haughty people who need to rethink their priorities. Eh, I’ll give them benefit of the doubt. I can’t eat a lot of this do to food allergies in our home, but I did learn from raising arrows or raisin olives blog that the flour can be stored with some diatamaceous earth to keep it critter free. You can also get food grade pails from a donut shop and buy different lids for easier access. Staples like beans, rice, etc can go in them. Bay leaves will keep bugs out. Plus if the flour is open a couple of bay leaves will keep the bugs away. That is so true! My Mom taught me to keep a bay leaf in my flour canister and I’ve been doing that for over 40 years…have NEVER had a bug in my flour and it’s in one of those old fashioned donut jars like cafes used to have on their counters..you know..clear glass, with a big silver lid and a red knob, with the opening on an angle on the front. It isn’t even a tight seal. Just thought you’d like to know! Be sure to store your sugar away from high moisture in the air or it will turn hard as a brick! Thank you for the info. I did not know this. Freeze your bag of flour for a few days. Then put it into your containers and seal. It will kill any larva that is in all flour. All flour comes with little tiny no-see-em bugs inside. Freezing will keep those from hatching out. It will kill anything that was in it when you bought it. If you are in a life/death situation, I really don’t think whole wheat and BPA are really going to be concerns. Seriously! This is food storage for emergencies. You can always buy organic versions of things, bpa free cans, wild caught tuna in cans, etc. if you want. But if it’s a choice between starving or eating in an emergency situation…I think you’d choose eating right? If you truly stop and read the nutritional value on the containers most of them are the same. They may have one gram of fat less than other. When doing wheat pasta instead of white pasta or soy-pasta. Take the time to read the lable to see what you are truly getting. The same thing as you were before. I have found that coconut oil is healthier than olive oil. It has a lot less fats, sodium, cholesterol, carbs, and is healthier to cook with. Savannah, You’re my hero. I started a while back trying to build up my supply of food, however, I am short on space and I didn’t have a real plan so it was kinda haphazard. This is so helpful. I’m going to work with this plan beginning with tomorrow’s grocery shopping, and I’ll be happy to have a guide. The one thing I would suggest is that those just starting out store the food in an organized way with the oldest in the front or on a particular side so you can begin using it and adding in new stuff to the back or the other side so nothing gets close to or goes past it’s use-by date. Thanks so much! Also, I was wondering if you would mind if I share this list on a blog post elsewhere? I will point the readers to your site as the source. I just think it’s really good information and I’d like to share it. Thanks. Another thing that will help with the organizing, is to write the date of when you purchased it. Also, to make it easier to read the best by dates, write them in permanent marker on the front or top of the canned item. Some more items to add to the list are baking soda, baking powder, canned fruits and veggies, canned and dried beans, dried fruits, bottled juices, different types of noodles, oatmeal (quick cook or old fashioned), baking chocolate, and on and on. There are also several things that you can get for your freezer, that will be good for 3-6 months. Butter can be stored in the freezer for a few months. To make the $5 stretch is to look at the local grocery stores and see what is on sale and buy then. Where can I buy 10 lbs of flour for $5????!!!!! Buy it on a week that it’s on sale. Flour usually goes on sale before a baking holiday, such as Halloween, Christmas, Valentine’s Day, St. Patrick’s Day. Same here. 🙁 That’s what I really need to learn. There are some great recipes on how to use your food storage. The LDS (Mormon) church has recipes on how to use your food storage items. I have got several recipes from it for things such as whole grains and oats because I’m not the best at knowing how to use them too. I have friends that take their 72 hour kits and have a party in April and October to use them up and restock them so they don’t go bad. You can write the dates of when you purchased things on them so you will know which ones to use first. There are also alot of pinterest ideas on how to utilize your items. Some have 30 years before they go bad. That’s why they suggest storing them. I would suggest making a binder to go in you food storage that has an inventory of everything and dates on them. Then add recipes to use with them in case you have no power to get to your computer and look it up. I struggle with it too but I’ve had times when my family has had to live for months on our food storage. Meals in a bag is another great idea. You put all the dry and canned items in a sack and put directly in your cupboard. Then you can just pull it out and add the rest. Like taco soup: 1 can green beans, 2 cans red beans, 1 can chili beans (if you like), 1 can corn, 1 packet taco seasoning, 1 can of meat (beef or chicken). Then when you pull the sack out, you just add water and boil. Its great for taking meals to others too if you are in a hurry! I hope that helps! What great ideas to add to an already great post. Thanks for taking time to share! This is a wonderful idea, but what sort of meals can you make with what is listed? The list seems a little random. Weaselby, I completely understand your problem. I had the same problem myself when we first started our food storage many years ago. My advice would be for you to start a month before purchasing and pay attention to what your family eats. My family does not eat tomatoe soup, ever, so there is no reason for me to have that in my food storage. Substitute things out that your family won’t eat for things they will eat. 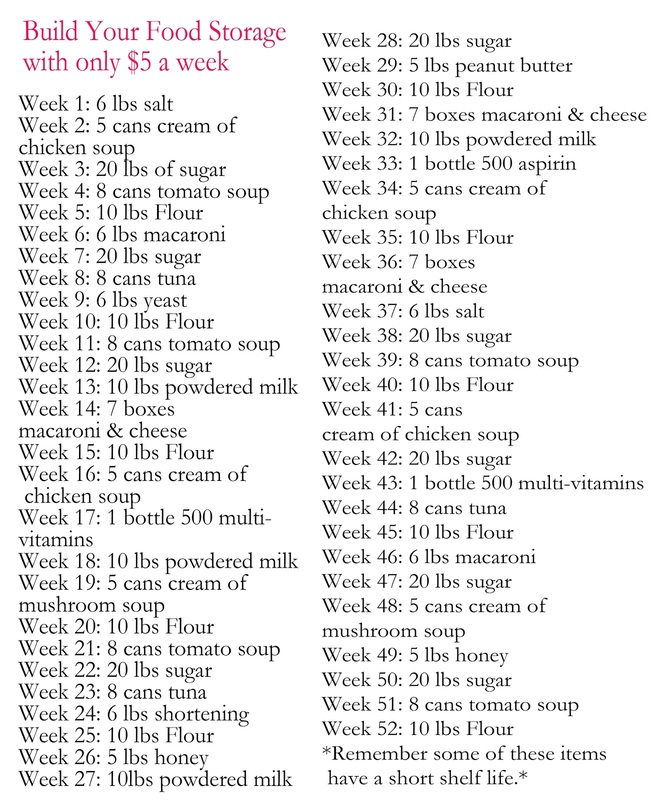 There is a cook book called “I Can’t believe its food storage” filled with many recipes that use items found on this list for food storage! (It can be found at Deseret Book). It is a great source for beginning your food storage also! Supplies for first aid kit: (band-aids, antibiotic cream, alcohol, hydrogen peroxide, eye wash, tweezers, clippers, scissors, gauze, cotton balls, q-tips, etc. I love the first aid kit ideas! It seems to get skipped over on the storage list sometimes. I also added some other random things to mine. Like baby wipes, a few diapers (they could be used for heavy bleeding if necessary), Ib Profen and asprin, a mirror, matches, a comb, small towel, blanket, feminie products, safety pins, rock salt (in case you ever are snowed in your car and need to get out), and a razor to my first aid kit. And I made a small version for our cars. And you can buy things from medical supply places for a lot cheaper too! I have not seen anyone comment on sprouting. Millions of people throughout the history of the world, as well as pioneers, could have been saved if they had sprouted part of their bag of wheat instead of grinding it into flour. Nowadays, we have found easier seeds to sprout–kamut, for instance, sprouts within 24 hours of first soaking, and it doesn’t go sour as does wheat when not rinsed often enough. Lentils sprout quickly as well. First aid kits are vital. Include sanitary supplies for various uses–pressure bandages on wounds. So many items in food storage may not be ones you eat, but as one contributor pointed out-good for barter. My indoor garden in the winter consists of several kinds of sprouts. With just a little practice, you can have healthy food for just minutes of care a day. That’s a great list. Thanks so much for sharing. What size family is this for? We’re just a family of three, but still growing. It might be something I could do a couple of years in a row, as the family grows. I just want to add that you need to think about your family before you start stocking up. For example, we have serious allergy problems in our family that require specific allergy medication, eye drops, and lotions. I agree with Nicole; start taking an inventory of all the products used in your household. If they are expensive, like our lotion, buy them when they go on sale or put an extra 2 dollars a week into savings for those items that are needed. Also, my husband is a Marine. We fortunately have access to MREs (Meals Ready to Eat) for way cheap. These are not only in food storage, but in our get up and go stashes (72 hour kits and our cars). To make this doable, you do have to have water to reconstitute the MREs. We also store other foods like beef jerky, peanut butter, and packaged tuna. These items do not need a can opener and are light to pack. They are readily available asap. I hope my list does not sound to “Zombie Apocalypse”, ha ha… we are just really prepared people. It is a military/boyscout thing I guess. We also have a bunch of MRE’s in our stash. A friend gave them to us. We just started stocking up this year and have done quite a bit. I am also the canning queen and have a 50×50 garden so we have lots of homemade soups, sauces, stocks, etc. What do you suggest storing the food it, cause I live in the south with heat, bugs, and rodents. Unfortunately, we don’t get much of a hiatus in the winter. I’m concerned about something getting into my food. If its stored properly, nothing should get into it. I live in Idaho where it could be 100 one day and -10 the next. So its good to be prepared either way. We store our things in buckets so that its organized and nothing should be able to get into it. I live near fields so I know how bad the mice can be. Good luck with it! I’m wondering is this per person or for a family of what size ? I got this list so long ago but if I remember right it’s for a family of four… You may need to adjust for your families needs. Something is always better than nothing especially when its food storage. I think it’s a great list, thank you. The original list has no flour, but what you’d end up with is 500 lbs of wheat, instead. It’s the only difference I see. BTW, it’s 2 people for 312 days. 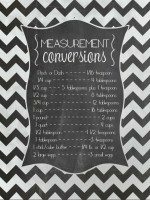 Do you have menus that you base this food storage list on? I would love to see them. Please share!!! Thank you. I’d like to know where you are getting 20lbs of sugar or 5lbs of honey for under $5 because I need to shop there. A 10lb bag of sugar is over $6. Either way this is pretty affordable I think. 180 lbs of sugar? Whoa! That is a heck of a lot of the “sweet stuff”! Savannah, thanks so much for this helpful list! For those who are anti-sugar – consider adding pure honey to your food storage as it has a very long shelf life. You can use it as a sweetener, in baking, for an energy boost, and it also has antibacterial properties so it doubles as an extra for your first aid kit if you run out of an antibiotic cream, or for sore, raw throats, some say it’s even good as a diaper rash cream (can’t say I’d want to test that particular theory out, buy hey – if it’s an absolute emergency & it’s all you have, it might be worth a shot). 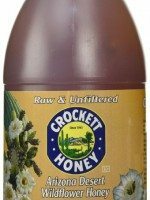 Locally grown raw honey is also great if you suffer from seasonal allergies – 1 tsp 2x a day has stopped my allergy attacks cold! I really don’t know why people get so hung up on sugar and white flour. When planning for a situation where you are going to need a year’s worth of food, you are trying to stay alive. That’s all. Think about that for a minute. Trust me you would feed your kids high fructose corn syrup if that’s all you had to keep them ALIVE. White flour and sugar are inexpensive and have a very long shelf life if stored properly. I personally would add more protein to this list but it is a good starting point. Also, don’t forget to put together your cache of non-hybrid seeds and medical supplies. Think about where you are going to get water also. Water is one of the hardest items to stock pile but it is the most important. Access to clean water is what will be the downfall of most people if ever put in a survival situation, especially those in urban and suburban settings. We live way out in the woods and have a hand dug shallow(25ft) well. Our well water for drinking and cooking goes into our Big Berkey water filter. It is the same as the red Cross uses and comes in different sizes.It filters out EVERYTHING.We could put water right out of a stagnant pond in there and it would be fit to drink.Stainless steel and uses 2 or 4 silver and charcoal filters. Add me to those who would love to see ideas of what meals to make with all of these ingredients. Obviously I’m sure I could think of things at the time, but in order to stretch the food as long as possible and use it wisely, I’d love some ideas! Great List! How do you store everything? interesting list, except i’d trade out the cream of X cans for chicken stock, canned tomatoes and canned beans (garbanzo/black). rice & water for all that sugar. and salmon for the tuna. Thank you so much for this list, it’s a great starting point. I have many deadly allergies so I’ll have to change some things but at least I have something to go on. As for people who swear they don’t have enough room, if your life depended on it I’m sure you’ll wish you’d owned less shoes, stored things creatively or just rented a small storage space. Anyways, my plan is to map out the cost to double the list (I’m going with the idea that it’s for 2 people for just under a yr..better safe than sorry)and plan what I buy with my budget. If I have some bonus money from work I’ll buy some of the pricier things,just a few dollars to spend then I pick up something that’s cheaper. Having something is better than nothing. 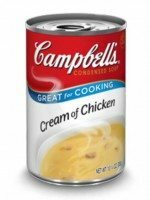 Also watch sales ads.first of this month Kroger had Campbells soup 49 a can,carnation evap milk 69 a can,swanson broth 49 a can,green giant veg 49 a can. I used coupons and got an even greater deal.Around holidays is a good time to stock up as many items go on sale. Thanksgiving and Christmas are great times to stock up on staples for baking. Also learning to can food and dehydrate are great skills.Grow and dry herbs is easy. And garden, even if you have to use 5 gal buckets and trash bags. 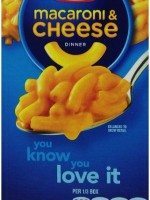 Just an FYI: Boxed Macaroni and Cheese DOES expire. I know from personal experience. We have a stock pile of food & had to use some during a financial strain. The powdered cheese pouch is what expired. It tasted HORRIBLE! Love this list! Its a great starting point and looks less daunting then some lists I’ve seen. I’m just trying to get our 72 hour kit going as well as are camping gear which can easily go hand in hand. Thanks for posting this!! Gave me the idea to get myself in gear and get a list for our Family together to start our food storage! I have seen a website where they show you how to can dry ingredients, like flour and sugar. I think they called it “dry-canning.” Anyway, it’s something to look in to if you’re worried about creepy-crawlies getting into your dry goods. How about adding Spam and vinegar and maybe Oatmeal? This is exactly what I needed! Thank you! My only question is, what about expiration dates? So I am a new, younger wife that hasn’t had a whole lot of time to become domesticated not to mention I grew up eating fast food. Home cooking wasn’t exactly a luxery my parents wanted or had time for…. So what is it exactly that I can do with all of this sugar, flour and salt aside from bread and cookies? How is it that all of these ingredients are going to be so helpful other than the fact that they are common ingredients? 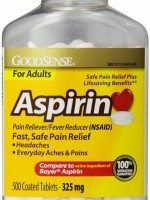 I have a question about your list and how many people does this supply for. In our house there is just my husband and me. Another thing to consider… your pets! Don’t forget that they need to have a little food storage too. I have found lots of DIY dry mixes for the cream soups and hot chocolate mixes if you want to make them up yourself to add. I have found several on Pinterest. And don’t forget your hand can opener! The shortening can also have a wick put in it and used as a candle if needed. So its great to stock up that! Just don’t forget to by some wicks to store! This might sound wierd but you can also dry pack your tampons. I haven’t tried it but I have seen it done. They are no good if they are already wet! lol! This is a great list. For those of you that are wanting ideas on what to fix with this stuff, let me tell you how I do my food storage. I think in terms of meals that my family will eat. 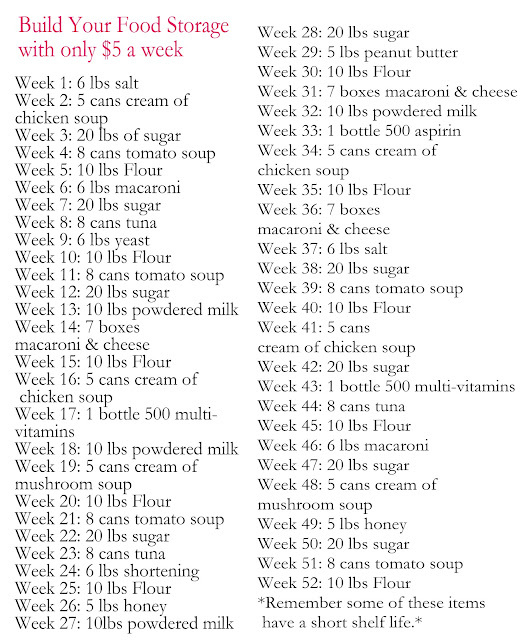 I have read somewhere that you find 7 meals or 14 meals that your family will eat and then times the ingredients by 52 for the 7 meal plan or 26 for the 14 meal plan. I have done this and it works great. I store the food I know that we will use. Example: 8 Can Chicken Taco Soup takes: 1 large can of chicken (drained), 1 can of pinto beans (drained), 1 can of black beans (drained), 1 can of corn, 1 can of diced tomatoes, 1 can of cream of chicken soup, 1 can of green enchilada sauce, 1 can of chicken broth, 1/2 pkg. of taco seasoning mix, 1/2 pkg. of dry ranch dressing mix. Mix all together and heat until warm. You can add cheese, fritos, sour cream etc. for garnish if you would like. So for my food storage plan I will make sure I have 26 of each of those cans mentioned (I am doing the 14 meal plan) This way when I make one of my meals for dinner, I am rotating the cans out and always have newer cans in my stash for my meals. I have no pantry, so I bought a large storage rack from home depot with 5 shelves. I use the soda can holders that rotate (usually used in the fridge) to rotate my cans on the shelves. I have this in my laundry room & I just got another one to put in the office. Every six weeks or so, the grocery store cycles have every item you can imagine on sale. The best way to stock up on items is to watch to see when they go on sale and use a coupon, if you have one. Paper towels, soap, toothpaste etc are always on the sales cycles. Just make sure that you store stuff that your family will eat and that you have items that you need to fix the meals with. Example: I store flour in my food storage because I don’t have a wheat grinder (Yet, those puppies are expensive!!) So why store wheat if I have nothing to convert it to flour? 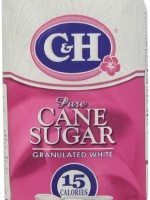 I bought a 25lb bag of sugar a few years ago and it lasted my family of 3 almost 2 years… and I do most of my own cooking. Granted, I’m not baking cakes from scratch every day 🙂 I think this is a great place to start but the list is a bit dated for our modern “health consciousness”, though I absolutely agree that if you need the food, you won’t much care what it is and won’t be sorry you have it. And of course, people, use your brains and don’t buy something your family would never eat–but be sure to replace it with something nutritious that you will. (The bartering is a GREAT tip)! For those who are LDS, I firmly believe that part of the reason for our food storage is to show how we use it in a crisis–do we guard it with guns or do we give it to our neighbors? How many people is your list designed for? Don’t forget the stuff to make chocolate milk. For when you have to drink powdered milk, just make chocolate milk out of it and it tastes so much better! Add vanilla to powdered milk after you make in advance and chill overnight. Baking soda and baking powder are usually needed to make use of the flour. Baking soda doubles as an antacid. Vacuum sealing is also excellent for waterproofing items such as matches, bandaging materials, and other water sensitive items in your bug out bags. I like the technique of vacuum sealing enough rice/beans/pasta in a pouch for one meal and writing the cooking instructions on the bag- after all it may not be you that ends up using this food. Use either food storage rated 5 gallon buckets or the 5 gallon buckets that “Tidy Cats” kitty litter comes in to store your vacuum sealed items. The 5 gal buckets are available at Lowe’s and have locking lids with seals. Look under the litter bucket and see what the Recycle number is. It will be a number between 1 & 7.. but only 1, 2, 4, and 5 are safe for contact with food. That is unless you seal whatever food you are putting up in foodsaver or Mylar bags. Lots of places will sell you their used 5 gal buckets with lids- I picked a few from Firehouse Subs that were used to store pickles; I bleached them with pool shock I my bath tub and it took 90% of the smell away ;-). Kroger bakeries will either sell or give away their 5 gal frosting buckets that can be washed out and used. SO here is my problem. I don’t cook at all. So even if i did have all of this I would starve. 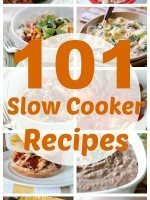 I need a list of Recipes that goes with this list. A meal plan to use all of this. Where can I get that? I would add in less sugar, or more honey and brown sugar, more legumes (beans, lentils, split peas, refried beans), some tortilla mix, long grain or wild rice, steel cut oats, canned veggies and fruits, etc. Buy yeast in bulk rather than the little packets, and store it in the freezer. Get a good sour dough starter recipe, and learn to use it regularly. Also, things like Dr. Bronner’s soaps (good for dishes, laundry, and body wash! ), baby wipes, OTC meds that you regularly use, look into family cloth, cloth diapers, and mama cloth rather than filling up space with tp and disposables. Put together a good first aid kit (stock it yourself rather than buy one!) and an emergency kit (flashlight/headlight, basic tools, nails/screws, tarps, duct tape, items for plumbing and electrical repairs, etc.) Buy a tent and some sleeping bags ~ used is fine if they are in decent shape. Add in a camp cook stove, candles (pack matches in jar candles so you can light them when you need them). Pick up either cast iron or SS cookware, a decent percolator coffee pot (you can use them to make coffee, tea, or just heat water). Get a weather/emergency radio, preferably one that has a solar charge AND a hand crank. Check into a few small solar lanterns. You can leave them on a sunny windowsill and they will always be ready if the lights are out. Maybe I am a complete dork, but I need sources of recipies to use the ingredients that this list provides. Purchase and store what you eat, eat what you store. Go in with another family and buy in bulk. 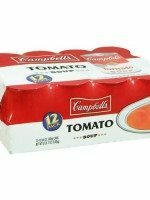 It comes on sale at various food storage companies and can be ordered online. most of the time, the more you order, the better the price. I agree…just bought a 4 lb. 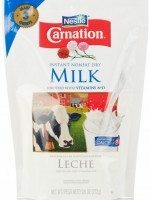 box powder milk for $14.98 at Walmart. Not a cheap product, but one you should have on hand. Everyone’s food storage/system will be different (preferences, family size, etc). There are companies who will spend time with you to refine a system that works for you. These are typically companies who SELL products, but they are trained to help you. This is how we finally refined our system. We chose about 15 basic dinner meals with some favorite lunch, breakfast and snack type “recipes” that we regularly eat – from products that are STORABLE. We multiplied by 12 and have about 6 months worth of those meals. In an emergency, we have our favorites. In a LONG term emergency, we have additional items that will keep us alive for another six months. We’re constantly having to replenish as we rotate on a regular basis. I look for bargains/sales and purchase accordingly. There are sales on almost everything every couple of months. We have had two times in our married life that we were unemployed for extended periods of time and relied on our food storage for financial survival. Also, when we have been without power, it has been nice to have a camp stove, propane, a solar oven and lots of candles and matches. BUT, the first things EVERYONE should begin storing is WATER!!!!!!! One last thought. We have moved away from using/storing a lot of canned goods. Even though it is labor intensive, canning our own foods (fruits, veggies, even meats) assures us of quality. It also leaves us with no doubts about artificial preservatives, etc. It was so worth purchasing a pressure canner and learning these “old-fashioned” ways of preserving the foods that are most nutritious, healthy, as well as palatable. I have tried to incorporate this as a teaching and bonding activity/opportunity with my kids as well. LOVE this!! Plan on starting to build my storage asap. WATER! WATER! WATER!! With all the issues of water being contaminated, make sure you have enough water for several weeks, if not months, for everyone in your household, including pets. WATER!! I love this list. It’s a great way to get started and compile a good amount of food and supplies. Thank you so much for putting it together! I guess I’m wondering how and where you store all this that bugs don’t get into it. I have to store my flour in the freezer or else I get bugs. That’s bag enough when I have to throw away 5 lbs. but I can’t imagine throwing away 100 lbs of flour because of bug infestation. This has helped me so much;giving me a knowledge base in helping me decide what I want to store and how to go about doing it and what a year supply may look like and on a budget.wonderful, thank you ! I am wondering about this 6 pounds of yeast? Is that a misprint? 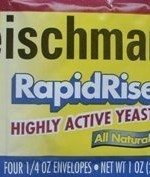 How can you buy 6 pounds of yeast? You can get yeast vacuum sealed at Costco or Sams. I’m not sure how big it is, but it lasts for me longer than the expiration date. You can store it in the freezer for much longer. How many people is this list good for? We have a family of 7. And is this for a year? Anyone even considering the fact that many emergency situations mean no electricity or running water….flour do you no good if it can’t be cooked. Better find some place to stash a potable grill or propane powered oven! Hi Joanne! You’re absolutely right. However, this list is just for food items. You will need many other items for emergency situations. This list is not just for emergencies and is also handy for times when money is tight, poor weather that keeps you from the grocery store or other less severe emergency situations. Thanks! I would suggest if you take prescription medicine to try and store some of them too. Live this idea but where do I find somebody these items for $5.00?????? This is $5 a week on average. Some weeks will be more some weeks will be less. This is an average of $5. Thanks! Which items need to be rotated more often? Is there any way to get an * put by them? Food storage can be tricky. Invest in food grade 5 gallon buckets with rubber gaskets. You can find them for sale in hardware stores and wal-mart, but a LOT of big restaurants and bakeries and even bakery supply stores give them away or sell them very cheap. I have more than a dozen I store pretty much everything in. Good quality tupperware or similar containers simplify things a great deal and make organization much easier. Water is important, but also the hardest to store, consider investing in survival water filters. These can be found in sporting goods stores and come in a number of sizes, types and budget ranges. Do keep a case or two of bottled water in addition to filters, in case any water is hard to find. Do invest in club store memberships. You can buy a lot of common items in bulk for deep discounts if you look around. If the membership seems too much, go in with a friend or neighbor or two and split the cost so you all benefit. As for recipes, look at what your family eats, and how food storage can be built around it. If you hate tuna but love pasta, then stock up on a variety of dry noodles and different types of sauce. Homemade soup of many types can be made from a mixture of canned vegetables and dried or canned meats. If you are worried about high salt in canned foods, buy the no salt added varieties. Improvised ovens can easily be made from metal trash cans and charcoal, a la Chef Robert Irvine. Look at camping and backpacking websites for ideas on portable and improvised ovens and cooking stoves. Stocking up on canned fuel might be a good idea for your family, or do a little research on improvising your own fuels from olive oil, shortening, or other items. A small tabletop BBQ grill can provide a good place to cook meals and won’t take up much room. Also keep in mind some items will be very useful for bartering or trading, even if you don’t anticipate using a lot of an item yourself. I wanna say thank you for this amazing and helpful information, I have always wondered do to my budget how do I start something like like this. I thought about couponing, but I really don’t have the free time to do this so i am gonna try it this way and see how it works out. Again thank you for this and just disregard the people that are small minded. Seems to me their just board and need to grow up. Have an amazing day. Also if you come up with any more great ideas please email me. Thanks. Thanks for the list! I would add, at some point, my favorite spices. Great starter list that I am going to use to help keep me on track. Great list and easy to follow. Also if items are not liked by your family, substitute something that works for you. Also, sometimes it’s a little hard to find the funds to buy food storage, especially if you’re just starting out. Believe me, I know from experience that you will not be very picky in an emergency situation but you must store what you will eat. 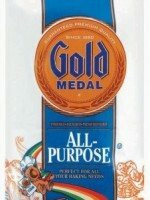 All these comments about canned goods make me think that these products are never used in the household. Also some of the comments about them are very outdated. Canned food is canned at the peak of freshness, you can get fruits without added sugars, veggies without added salt, in a huge variety these days. Some folks don’t have the means to can their own produce even if it’s great to control the product. I love to can, preserve and pickle and we eat what we can. Just a reminder, unless you have a generator, it’s not a good idea to freeze a lot of produce, meat, etc. as part of your food storage. Since we live on the Gulf coast, we are hurricane prone and do know the results of no power for an extended period of time. You can lose everything in your freezer, therefore losing dollars as well as the food needed. Also, there are companies such as Emergency Essentials, that have a huge variety of foods, dry packed and freeze dried, sealed in #10 cans. I’m talking basics here, not just add water entrees. If you prefer whole wheat flour, hand grinders are available for a modest price. Whole wheat can be purchased in pails or sealed in cans. Whole wheat flour cannot be stored for long periods of time because it becomes rancid, but grinding your own is an alternative. This is also true of whole wheat pasta. One last thing, 5# buckets are handy for bulk storage and several companies have screw on lids called “Gamma Lids” that fit these buckets, seal well and are easy to open. They also come in several colors so you can color coordinate your storage. I’m definitely not an expert but I wanted to share a few things that I have discovered. My mother has been doing food storage little by little as well. What I really like is how she saves water. She takes any plastic bottle (usually Gatorade cause my dad drinks a lot of it) and fills it with water. She stores it against the wall and just keeps piling them up. She’s gotta have at least a hundred bottles by now. And if they need some for the road, they grab a few and then refill later. By “last” I meant while using. Susan G from Kentucky,this list is for a family of four for stockpiling for an entire year,incase of an emergency!,, and Not just a week or two emergency,a disaster!! !the list will be different for all,because of what your family needs will be.It is a great list that can help you get ready for any emergency,and you not have to worry about your family,or yourself starving to death.The list these ladies have put together is a plan to help you gather items without breaking the bank,there are many more great ideas too,if you scroll through all the comments you will see,some awesome list, others have compiled also for first aid items,clothing,and also if you have pets…I hope this is helpful and no question is crazy,uppity,or silly,especially if you want to know more about how to keep your family and yourself alive during any kind of disaster.Hope this helps, Candy H.
Thank you for this list! I have two dogs, too, so I will be working canned dog food into the list somewhere. Let’s not forget our furry family! I like the concept. I’d sub a few things out. 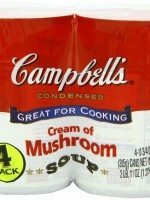 We don’t use cream of mushroom soup that often. But we DO use taco seasoning. Everything from taco night to enchiladas (we eat quite a decent amount of Mexican food since hubby’s grandparents were missionaries there). And I’d replace the macaroni with penne. It’s just more versatile. We use it for everything from rigatoni to chicken alfredo. What size family is this for? This is a good starting list, but this would not stretch a year for more than 2 people. They would be cranky and malnourished if this was all they had. I would suggest getting rid of the vitamins and some of the tomato soup for canned fruit and veggies. You would need to add rice, barley, beans from the dried section too. I would also suggest rolled oats. These would make things go much further and have more complete meals. Store food that are not perishable and that will last alonger time. Always check the expriation date for the food not to be wasted. What a wonderful list. Thank you. We live in the country quite a distance from a store, so my husband taught me early on, that you must have a supply of Wheat Berries. Evidently you can do so much with Wheat Berries. You can use them to make bread, you can put them on a salad, you can sprout them, you can cook them and eat them as a hot cereal. I never have, but if the need arises, we’ll be prepared. Last year , due to a snow storm and where we live, we were 13 days without electricity. The snow was so deep that the Trucks couldn’t get to us, thank goodness for our storage. 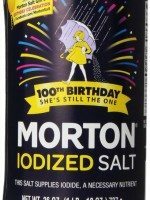 I also can a lot, and in doing research, I’ve found the saltier and sweeter something is the longer it’s shelf life is. So bags of Salt and Sugar have an unlimited shelf life. I can and make a lot of jams and jellies. So at any time I will have a couple of dozen different types of jams and jellies in my storage. I love to give them to family, friends and neighbors, which sort of defeats the purpose of storage, but they all love them, so I’ll just make more! One thing that I found was dry canning. It’s an easy and wonderful idea. You can put flour, beans, oatmeal, granola, powdered milk, almost anything, in a ½ gal Ball jar*, do not cap it. Put it on a cookie sheet and bake in a 200° oven for 1 hour. When you take it out of the oven, put a sterilized lid and cap on it and secure it. Then wait for the sound of a ping. Then it is sealed. It will have a shelf life of 30 years. Now that’s food storage! My husband travels for work, so when we are in a hotel, we make sure that we take those little bottles of shampoo, cream rinse, lotion and bar of soap to put in our storage. You paid for them, so they are yours. They are good to take on camping trips or to put in your storage. We have a well so we store 5 gal bottles of water. If the electricity goes out, we have no water so better to be safe than sorry. We also keep two bottles in our feed storage area for our chickens and dogs. I also store all salt, wheat berries and other items in 5 gal. plastic buckets with lids. You can find these at Winco in the bulk section. I know you have honey on your list. But never underestimate the importance of Honey. It must be RAW Honey and if organic the better, no additives. Honey is not just for sweeting things, it is also a good topical application for a wound. Do some research on the benefits of honey. You’ll be surprised. * Wheat Berries you can buy at Winco. * ½ Gal Ball Jars ~ You can buy these at Winco or ACE. If ACE doesn’t have them, ask them if they can special order them. * 5 gal bottles ~ I buy mine at Walmart with the screw on lids. Can anyone tell me if this list is for one person or more? Does this plan have enough protein? 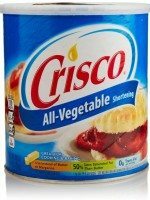 It’s a great list and it will supply a lot of the basics, but, one items the list you will not find for $5 is the powdered milk. I don’t know of anyplace you can make that happen. Best case I found was Sam’s Club, a 4 1/2 lb bag for $15. That makes 22 quarts which is about 88 1 cup servings. The most important thing to remember about food storage is you have to use it daily and rotate your storage. There is no bigger waste than spending all that money and not using it before it goes bad.